At last month's media event, Apple introduced the fifth-generation iPod touch, a revamped version of the device offering the same 4-inch display found in the iPhone 5 and a number of different color options. While Apple immediately began taking pre-orders for the device, availability was set for a rather vague "October" timeframe. As of earlier today, some of those early pre-order customers have begun reporting that their order statuses have shifted to "Preparing for Shipment", the final stage before being passed off to delivery companies. At least one customer has reported that his credit card has also been charged. The move toward availability comes just after users noted yesterday that shipping estimates for new orders of the fifth-generation iPod touch through the Apple Online Store in Australia had shifted from the vague "October" to "3 weeks". Those following through and placing orders were finding an expected delivery date of October 29. A similar shift was seen in the New Zealand online store, with deliveries there scheduled for November 2. These new orders are, however, likely to be delivered somewhat after the first batch of pre-orders placed as much three weeks or more ago, and shipping estimates for new orders in the Australia and New Zealand stores have since reverted to the previous "October" timeframe. Update 8:39 AM: Mac Otakara reports that the official launch day for the new iPod touch and iPod nano in Japan is October 9, although early supplies are likely to be tight. I wonder if this time around the iPod touch will have the same IPS LCD display as the iPhone. This would help explain the 100$ premium over the previous generation. The 32 gig 4th gen was also $299. 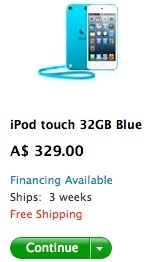 The previous gen cheapest iPod Touch was $199, now the cheapest one is $299. The 4th gen 32 gig, was $299. The 5th gen 32 gig is also $299. No premium. Just no 16 gig 5th gen.
Love the new iPod touches. Too bad I have an iPhone 5. But the cheapest one is now 32gb instead of 8gb. I'm glad they're phasing 8gb iDevices out. 8Gb isn't enough to do anything, especially when iOS eats up 1Gb before you've even started. Wow, after hearing about the success of the iPhone 5 and supply constraints, I'm amazed that they're actually going to start shipping these. Great! That means my new iPhone should be shipping soon. Hopefully all of the anodizing coating won't fall off on that bumpy boat ride over.